It was just before 9pm last night. I thought at first it was a ruddy big truck moving down my street. Or a really strong gust of wind. But the whole house was shaking. It passed after a few seconds. Nothing had cracked or fallen. I looked outside. Silence. No thunder, no wind. Twitter and later the MSM confirmed it: an earthquake of 4.7 on the Richter scale. Minor, all things considered, but still the strongest in the state since 2001. Graph from Geoscience Australia. It’s showing 8pm to 10pm. What part of Emergency 000 do people not understand? And if nobody is injured and there’s no damage, what would they expect the authorities to do about it? 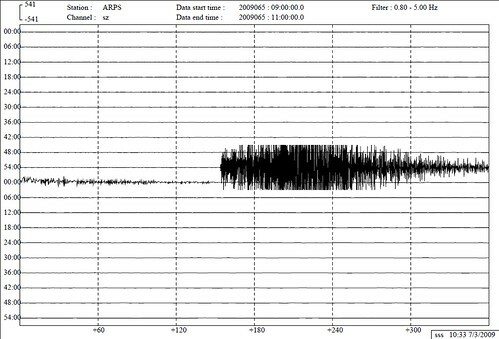 I thought someone was shaking my chair at the dinner table, but no… I was guessing an earthquake around 4ish .. pretty interesting graph you have there! I have absolutely no idea why people would call 000! I was in the CBD around this time looking for somewhere to eat in Chinatown. As I was walking I felt nothing. Sometimes trucks and trams can shake the ground too. I only learned of the earthquake when I turned on the computer a few minutes ago. It would have been neat to have felt one as I never have before. I didn’t know that Australia could have earthquakes. Many of the old brick buildings arond here would collapse in a severe one. I was sitting in the lounge room and the whole room seemed to shake sideways for a few seconds…thought it was a big truck too or my imagination until I heard the news. It was certainly a weird feeling. maybe people were ringing 000 because their take away shop had run out of chicken nuggets!! I too thought it was a huge gust of wind, our wall cracked really loudly and then the house shook. My flattie and I just stared at each other than started getting excited!! Didn’t feel a thing. Oddly, I was watching the Mythbusters episode about Tesla’s earthquake machine at the time. No the earth hasn’t moved for me for a while!